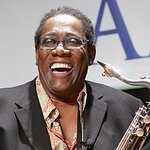 The late great Clarence Clemons was honored as Big Man of The Year at a special charity ceremony which featured Lady Gaga last week. Clarence – best known for his work with Bruce Springsteen's E Street Band – passed away earlier this year, but his charity legacy rocks on. In 2009, Little Kids Rock created the Big Man of the Year Award to celebrate his giving spirit and the support he showed to children around the world. Each year, Little Kids Rock give the honor to a musician who is passionate about helping the charity provide musical education to school children who would otherwise miss out. Lady Gaga was on hand at the event in New York on Thursday, October 20, to hand the award to Clarence’s widow, Victoria. “My first experience with music was my father playing vinyl of the E Street Band,” she told the crowd. "When I finished Edge of Glory, I said, ’There’s something missing.’ I’ve been through so many challenges and obstacles along the way, I didn’t remember what my youth sounds like. But the sound of Clarence’s saxophone was the sound of my youth. Find out more about Little Kids Rock here.